The app offers hundreds of colors and color shades for paints and paints, making the color selection process easier. Dump those paint swatches & sample tins for good. Fun & Easy! Virtually paint your home inside & out using real brand name paints & suggested palettes. 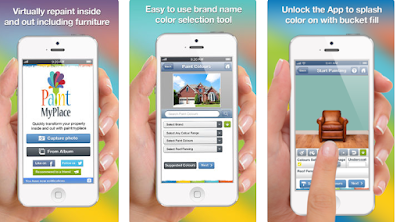 Simply capture a photo of your home & start painting today for Free! Paint My Place – Realistic Color Painter and Editor. Virtually Decorate and Remodel Your Home or Property – Free on the App Store! It allows you to visualize the colors you want on the walls of the room or on the cabinets and furniture, by loading the image, choosing the color and the paint, by placing your finger on the image.